The 1999 peace agreement in Sierra Leone came at a moment of crisis in the country, after many years of war marked by severe rights abuses. The rebel forces, the Revolutionary United Front (RUF), had attacked and nearly taken full control of the capital, Freetown, in January of 1999. The international community – including those who provided troops to defend the capital (Nigeria most prominently) and those providing military aid (such as the UK) – pushed the government to negotiate an end to the conflict. A military solution seemed impossible, given the weakness of the national army and the effective control by RUF over large parts of the country. RUF leader Foday Sankoh was in jail in Freetown, convicted of treason and under a sentence of death. He was invited to join the peace talks, which took place in Lomé, Togo, from April to July. The government delegation was headed by the Minister of Justice. Civil society was invited to attend the talks, and received international donor support to make this possible; they joined in the debates of working groups and considerably influenced the final outcome, including on the issues of justice, but they did not have voting privileges. The issue of amnesty was decided virtually before the talks began. It was clear to the President that an existing amnesty law would need to be extended in time, and his team entered the talks with that understanding. The working group handling security issues discussed this in its first meeting, and came to a quick agreement. As the talks continued, civil society tried to engage the government on this question, but received little substantive information. It was not clear to the UN representative, until very late, that the blanket amnesty and pardon for crimes of the war would be a problem in relation to UN policy. In fact, the UN had formally clarified its general position on amnesty just weeks earlier in New York, with a directive from the Secretary-General that stated that UN officials must not sanction or condone an amnesty for international crimes, including crimes against humanity, war crimes, or genocide. New York thus pressed the UN representative at Lomé not to sign an agreement that contained such an amnesty. This message was received the day before the signing ceremony. A resolution was found in the decision to sign, but writing in a disclaimer in the margin of the accord, stating that the UN understood this amnesty not to apply to serious international crimes. The legal effect of this reservation has never been clear, however: in Sierra Leone, the pardon and amnesty is considered to cover all crimes, and as of 2013 no one has since been prosecuted in national courts for crimes during the war. Foday Sankoh was given the post of Vice President and Minister of Mines in the transitional government, which he held for a number of months until conflict broke out once more. The Lomé working group on human rights, meanwhile, grappled with a proposal for a truth commission, which was first proposed as a one-sided inquiry to focus exclusively on the RUF, and thus badly received. When it was broadened to cover all actors – including the government forces, the paramilitary forces aligned with it, and implicitly any international forces – then the proposal was easily accepted. It was given the power to make mandatory recommendations (only the second such truth commission to date with such capacity, after El Salvador); unfortunately, the ultimate treatment of the commission’s report, both by the government and the international community, did not take advantage of this prior agreement, despite robust recommendations from the Commission. Some reforms were put in place over the next years, but slowly. When the truth commission concluded its report in 2004, it expressed support for the general amnesty, which it saw as necessary for peace. It also concluded that “the central cause of the war was endemic greed, corruption and nepotism” and that “government accountability was non-existent” over many years. It recommended extensive reparations for victims, including psycho-social and education support; several years later, with a $3 million grant from the UN Peacebuilding Fund and making specific reference to the truth commission’s recommendation, minimal cash reparations were provided to thousands of survivors. The idea of vetting was hardly considered at Lomé. Civil society did not raise it, and the government assumed this would be a violation of the spirit of the amnesty. It seems unlikely to have been possible given the insistence by Sankoh that he be given a senior position in the transitional government. An Uncertain Peace: Can the Amnesty be Blamed? Ten months after the Lomé agreement was signed, Sierra Leone veered back towards war. Hundreds of UN troops were abducted by the RUF; there were rumors of RUF forces advancing on Freetown; a protest march was met with violence at the RUF offices, and Sankoh fled. The UK government quickly sent in troops to stabilize the security situation, and Sankoh was found and arrested. Others in the RUF took over the leadership role, and continued to work with the UN and others towards disarmament. But it was a difficult next two to three years, with the peace on edge. The next several years were spent further stabilizing the situation, demobilizing the RUF, and putting transitional institutions on firmer footing. As a result, the truth commission did not begin until 2002.
International human rights organizations have often cited Sierra Leone to show that an amnesty leads to further conflict. Sierra Leoneans (and internationals who were closely involved at the time) do not necessarily understand it this way. Rather, the further violence in 2000 resulted from the slow arrival of UN troops in the country, and the resulting delays in demobilization and essential peace stabilization activities. There is no clear line between the amnesty in the Lomé accord and the further spark of violence. Of course it is true that the opportunity for conflict would have been considerably less if the RUF leadership had been jailed rather than appointed to government. But it is hard to imagine that this would have been possible in the context of the Sierra Leone conflict at that time. 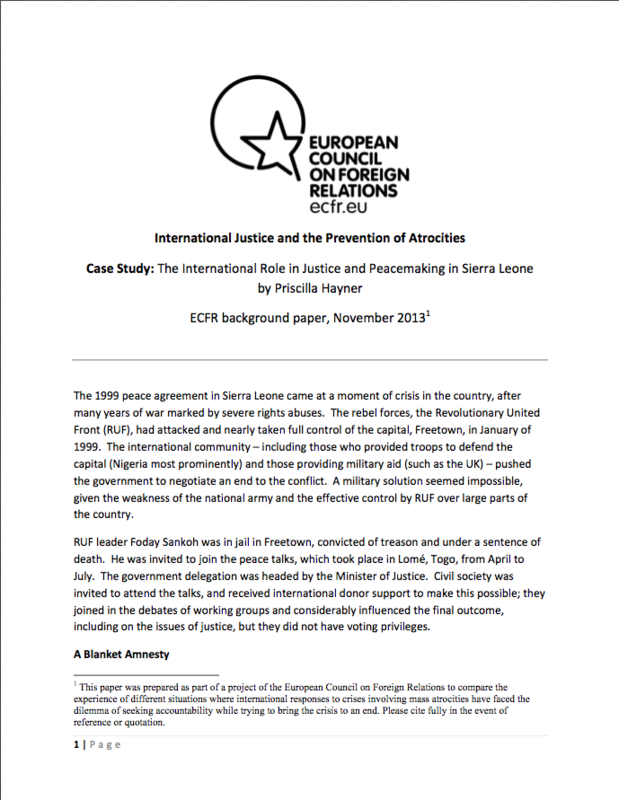 If the Sierra Leone peace process had taken place several years later, it is likely that the international disfavor of such a blanket amnesty would have been made much clearer much earlier. It is possible that, as in other countries, rather than an amnesty the accord may have been silent on the subject, and individual pardons for Sankoh (and others) may have been arranged instead. In the end, the fact of the amnesty probably facilitated the work of the truth commission, because ex-combatants could testify about their acts without fear of judicial consequences. Indeed, many of them did, in some cases leading to community reconciliation at the local level, especially for the many former child soldiers who had been forcibly conscripted into the war. The capture of Sankoh, in early 2000, required a legal response. Working in conjunction with key international partners, in particular the US Ambassador, the government of Sierra Leone requested the assistance of the UN in creating a special tribunal. The legal basis for this, at least from the perspective of the Government, was considered to be the fact that Sankoh and the RUF had violated the peace accord, thus losing the benefits therein, and not because of the disclaimer attached to the agreement by the UN. The Lomé amnesty, in any event, did not apply to crimes that took place after the accord was signed. Thus, the President considered it legally possible to try him at home, but he was well aware of the limitations of the judiciary. The UN agreed to the Court, but in terms that required it to be impartial and to consider all parties. The Special Court for Sierra Leone was thus created through an agreement between the Government of Sierra Leone and the United Nations. It was designed to be hybrid court, employing both national and international prosecutors, judges, and defense teams. It turned out that there was a greater reliance on internationals, especially as both prosecutor and deputy prosecutor. The Court indicted a total of thirteen persons; three of these have died; another is officially a fugitive, reportedly also deceased. The accused represented each of the three main entities in the conflict; among those arrested was the serving Minister of the Interior, who had led the government-aligned Civil Defense Forces during the war. He was arrested in his office, reportedly without incident, nor formal protest from the Government, which continued to cooperate and support the Court. The Court also indicted the president of Liberia, Charles Taylor, for his involvement in supporting the RUF; he was finally arrested in 2006, and convicted in 2012; his fifty-year sentence was confirmed on appeal in September 2013. Priscilla Hayner is an independent writer and consultant on transitional justice in contexts of peace negotiations. She is the author of a forthcoming book on peace and justice; this paper is based in part on research undertaken for that book.